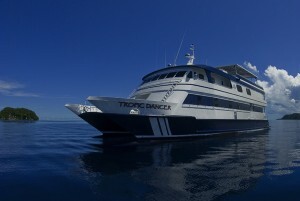 The Dancer Fleet of liveaboard dive boats wants you to Dream, Dive, and Discover picturesque Palau on a Sunday-to-Sunday scuba diving vacation aboard the spacious Tropic Dancer. Located in the Pacific Ocean, the island nation of the Republic of Palau is comprised of 328 islands. Palau lies approximately 600 miles (966 km.) east of the Philippines and 800 miles (1,288 km.) southwest of Guam. Diving and snorkeling opportunities abound in this rich marine environment. Whether above or below water, Palau will not disappoint. Your unparalleled vacation experience includes tropical island beauty, waterfalls, rainforests, lagoons, and white sandy beaches. Underwater you will experience unspoiled and spectacular reefs, caves, sheer walls, and blue holes, teeming with aquatic treasures such as lush, soft corals and huge anemones, jellyfish, sharks and much more. Large pelagics including Grey Reef and White-tipped Sharks, Spotted Eagle Rays, Napoleon Wrasse, Schooling Jacks and Barracuda, as well as remnants of World War II all combine to make this a truly memorable scuba diving experience. With 700 species of coral and 1,500 species of fish identified, Palau has been described as one of the Seven Wonders of the Underwater World, worthy of preservation and protection. Ideally suited for more vacationsome divers, Palau provides excellent diving opportunities, mostly wall and drift diving. The Tropic Dancer will take you to favorite dive sites along the barrier reef including Blue Corner and German Channel, among many other sensational dive sites. Depending on existing conditions, visibility ranges from 60 feet (18 m.) to more than 150 feet (45 m.). There are plenty of photo and video opportunities in the waters of Palau. Most diving will be done from a tender. Weather conditions permitting, your diving schedule will include 4-5 dives per day, including night dives. Two dives will be offered on the last day. In order to protect the reef and enhance your dive experience, the use of a reef hook on some dive sites is recommended. A reef hook will also help you maintain proper buoyancy control and positioning against very strong currents. You may also have the opportunity to do snorkeling, swimming, and beach combing. All dives should be planned as no-decompression dives. Before making your first dive, you will be required to present your c-card or proof of diving certification to the divemaster. Palau, with its tropical climate, is pleasantly warm year round. Air temperatures can range from lows of 75°F (23.9°C) to highs of 88°F (31.1°C). Water temperatures are equally warm, generally above 82°F (28°C). 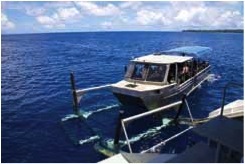 Palau’s rainy season occurs between May and September. Although rain is typical at least once a week, the months of February to April are considered Palau’s dry season. Because of the number of dives you will making, we recommend that you bring a 3mm wetsuit, which should offer sufficient protection and keep you comfortable. Big Drop Off wall is popular with both scuba divers and snorkelers, and is considered to be the most beautiful wall dive in Palau. At low tide, this sheer vertical wall starts as shallow as two feet (less than one meter) and drops to 600 feet (183 m.) Here you will see Sea Fans, hard and soft corals, and schools of Pyramid Butterflyfish and countless other tropical reef fish. Perhaps for the schools of Grey Reef Sharks that swim the edge of the wall, Palau’s world famous Blue Corner dive site is the best known and most highly rated dive site. It features a shallow coral shelf that jets out to the ocean and presents vertical walls on either side. The currents here create an up-well that attracts other large pelagics and schools of fish along the top edges of the walls. Divers are often accompanied by two resident Napoleon Wrasses. At this site you can also expect to see Dogtooth Tuna, Manta Rays, Eagle Rays, Hammerhead and White-tipped Sharks, schooling Barracudas, Turtles, and a multitude of reef fish. Located next to Blue Corner is the Blue Holes dive site, a huge underwater chamber formed by the convergence of four large holes in the top of the reef. You will see soft and hard corals, Sea Fans, and Sea Whips in an enormous opening on the wall here. At this dive site you will also find are Napoleon Wrasse, Grouper, Triggerfish, Moorish Idols, Butterflyfish, turtles, and anemones. Encounters with Grey- and White-tipped Reef Sharks, Jacks, Tuna, Eagle Rays, and Barracuda are common. German Channel is a man-made channel on the southwest side of the barrier reef. At the outside mouth of the channel there is a cleaning station known as Manta Rock. Giant Manta Rays and Grey Reef Sharks gather to allow cleaner Wrasses pick the parasites and debris off their bodies. Photo opportunities abound at the mouth of this channel which is home to virtually every form of marine life, including Barracudas, Snappers, Titan Triggerfish, Lionfish, Gobies, Leaffish, and an Octopus. A nearby coral garden displays anemones, Clownfish, Nudibranchs, Flatworms, and Crocodile Fish. Jellyfish Lake is another amazing dive site you may visit. You will first make a short hike through a beautiful forest to reach the lake which provides the most unusual snorkel experience in the world. Incredibly, the clear-water lake is home to some two million non-stinging jellyfish but no other aquatic life from the ocean. Note, this site is occasionally closed by the local government for environmental reasons. You will enjoy an extraordinary deep dive at Siaes Tunnel, which is located on the west side of Palau, near the Ulong Channel. The entrance to the tunnel is about 20 feet (6 m.) high and 52 feet (15 m.) wide, and starts on a sheer wall at a depth of 70 feet (21 m.). You will swim through the tunnel which parallels the wall and stretches for 150 feet (45 m.). The tunnel contains a huge cavern with depths ranging from 80 to 90 feet for the ceiling (24-27 m.) and 120 to 130 feet for the floor (37-40 m.). 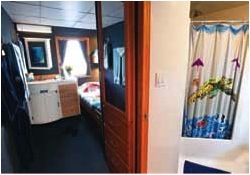 As you reach the halfway point of your swim through the tunnel you will come upon a window in the wall that looks out into the deep, blue waters. You eventually exit the tunnel through a large opening in the wall at depths of 80 feet (24 m.). In and around the tunnel you will see Turtles, Stingrays, Sharks, and schools of Jacks. The Iro Maru is a 145-foot long (44 m.) merchant ship that was sunk during World War II by American bombers. The wreck of the Iro Maru rests upright in about 120 feet (37 m.) of water. 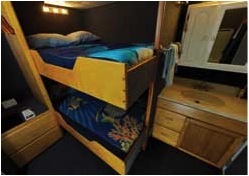 You will find numerous invertebrates and hard corals on the three mast and gun turrets. Other well-known dive sites the Tropic Dancer may visit during your excursion to Palau include Chandelier Caves, Denges Passage, New Drop-off, Ngedebus Coral Gardens, Ngerchong, Peleliu, Short Drop-off, Ulong Channel, and Wonder Channel. 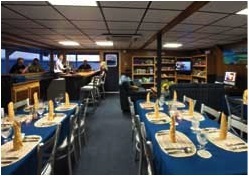 The Dancer Fleet strives to provide scuba divers and vacationers with the highest quality, most memorable and innovative liveaboard experience possible. In addition to unmatched scuba diving, guests aboard the Tropic Dancer will enjoy excellent accommodations and delicious meals as part of their vacation package. The Dancer Fleet’s dive boats afford guests both safety and comfort as they travel to the best diving locations around the world.